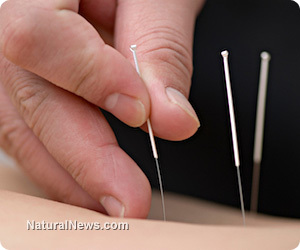 (NaturalNews) Most NaturalNews readers have anywhere from a vague understanding to a first-hand experience of acupuncture. But moxibustion needs to be explained a little. With moxibustion, heat is applied to acupuncture points instead of needles. The purpose is to move Qi or chi as needle stimulations do, but also to remove cold from one’s system. More details are available from source (1) below. In vitro fertilization is codified as IVF. In vitro refers to lab glass containers, usually petri dishes; in vivo is a reference to live whole organisms, from rats to humans. In vivo procedures to circumvent infertility involve a real human donor who is impregnated with the injected sperm of the infertile woman’s husband or another donor’s sperm. As the embryo begins to form in the donor’s ovaries, it is removed and inserted into the infertile woman. However, TCM (Traditional Chinese Medicine) has quietly been establishing efficacy at increasing fertility in both men and women. This has come to the attention of the western medical scientific community, which must “prove” empirically established procedures by randomized double blind testing. A San Paulo, Brazil randomized clinical study, “Influence of acupuncture on the outcomes of in vitro fertilisation (sic) when embryo implantation has failed: …” was recorded by PubMed March 19, 2013. They used 84 women on whom IVF had failed at least twice and divided them into three groups of 28 each. The rates of pregnancy were 35.7 percent among those who were administered correctly-applied acupuncture/moxibustion with IVF, 10.7 percent among the sham (false) TCM applications, and 7.1 percent within the control group receiving only IVF. This Brazilian study was formed because of IVF’s low rate of success and word on the medical street that TCM was working better without either in vitro fertilization (IVF) or in vivo embryo transfer. So the study does enable Western medical practitioners to still get bucks for their IVF while boosting their success with TCM as an adjuvant. It could be considered a win-win for both sides. But either Brazilians have universal health coverage or many are well off. Here in the USA, that 10 grand or more for IVF comes from private piggy banks. So what if TCM alone works well with much less expense? Short answer – it does. An interesting example is Dr. Randine Lewis, who ditched Western medicine and went fully TCM to form The Fertile Soil group after her own infertility issues had led her to TCM for solutions. Again, TCM performs without invasive treatments or pharmaceutical drugs with less costs and often achieves fertility goals with side effects of overall health improvements. Dr. Lewis and others are listed below with more information under the heading Sources below are TCM for infertility options. If you or your partner have fertility concerns, find your local area TCM clinics and inquire.